Real estate investing is as much about buildings and locations as it is about relationships. Everyone wants to be in the know, have an edge and be popular. We all are participants within an ecosystem. Our role, whether acknowledged or not, provides certain privileges and opportunities that we can leverage to grow our businesses. You are a brand. Just like Google, Pfizer and Proctor & Gamble. These brands are known by their products (search engine, Chapstick, and Tide) bring recognition to the brand and more sales build upon the credibility they have in the marketplace. So too, are you known by your products or investments. When people see you in the market and doing transactions, more opportunities will come to you. Fundamentally, real estate is a people business. People foster, create and build relationships both personally and professionally. The market factors of production include labor, capital, and land however the flow of inputs and outputs require households and firms. Both of the latter are comprised of people and more importantly relationships. The people you interact with and spend the most time with, you will be most like. Success breeds success. Our connections enable us to reach our full potential and have access to opportunities. For those of us that were not the captain of our high school football team, prom queen or homecoming court, we can find ourselves jumping at opportunities to feel in the “in crowd” as an adult. The key is to leverage this innate desire for companionship by seeking relationships with those who will encourage you to do and be more. Likewise, you can be the person that defines the in crowd by becoming a micro celebrity in your local real estate investing community. A ‘micro celebrity” can be defined as a person whose name, brand, and personality are well-known within a narrow niche. This could be within a specific industry such as real estate, or in a city by being well connected and hyper local. 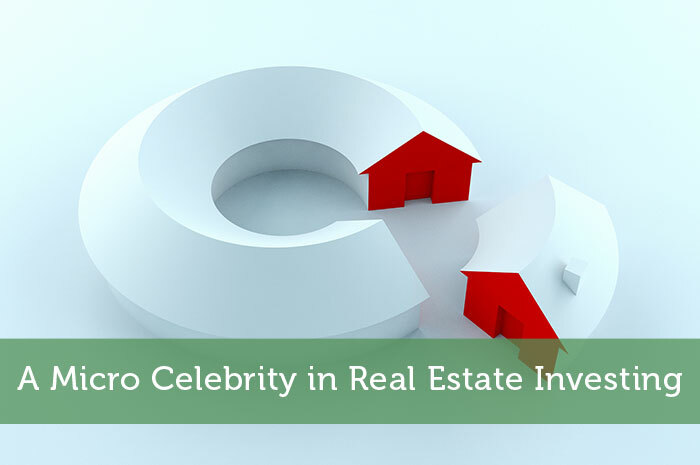 Being a micro-celebrity gives you a pulse on the real estate market. When the major players and community stakeholders know who you are, looking for deals and opportunity finding becomes easier. When creating your real estate investing business plan, being well connected in your target market should be listed as a strength in your SWOT analysis. Because real estate is first about people then relationships, you need to be known and recognized in your local market. You must have a voice in the conversation. We’ve all come to know and love the show Shark Tank. How exciting would it be to pitch your business venture and idea for scale and growth. Daymond John, Mark Cuban, Barbara Corcoran, Lori Greiner, Robert Herjavec, and Kevin O’Leary are each business people that deserve the respect they are given. We know who the sharks are and we want their investment money and guidance. The desire behind the desire to associate with the Sharks is to associate with who the Sharks associate with. Think about it. You not only want access to their experience, it’s access to their network that really makes dreams come true. These sharks leverage their brands, past ventures and influence to continue to enter new markets. The sharks no longer have to go far to gain opportunities or potential deals for investment. Again, a person’s network is directly proportional to their net worth. You gain a reputation and credibility. You’ll have a vast and strongly connected network. Inside information is illegal in the stock market, but should be considered a competitive advantage in real estate investing. Of course we can’t just tell you how important it is to be connected without pointing you in the right direction. Become a social butterfly. Take every opportunity to meet new people and create genuine relationships. Learn about others and their interest as well as share how you can add value you. Be consistent and stay in the game for the long term. Now you are in on an age-old secret that has helped real estate investors for years and years. Just like any other business, your real estate investment portfolio is a reflection of you and your values. The more people that become interested in your success, the more successful you inevitably become.